📅 📅 August 2017 March 17, 2019 by Bruno B. 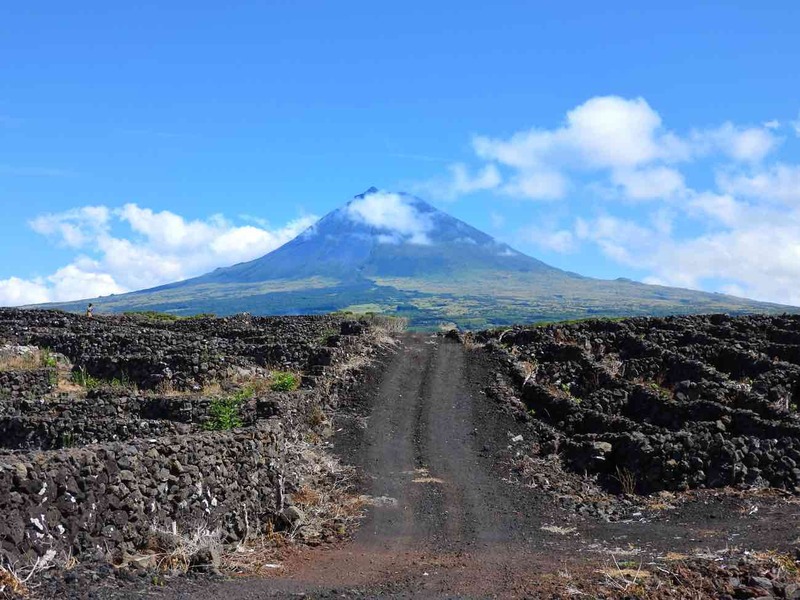 This easy-to-follow Pico travel guide contains all you need to know to explore Pico island in Azores. Find out places to go and how to budget and plan your itinerary. And of course, what and where to eat. Each island in the Azores has its own charm and appeal. You’ll need at least a month to go through them all. Pico, the second-largest island in Azores, is nicknamed “grey island” because it’s the most volcanic and basalt-y of them all. Dramatic landscapes of all kinds of lava formations dominate the scenery, contrasting with the blue of the ocean and the white from the foam of the waves. A very different kind of paradise from the greenery of São Miguel for instance. 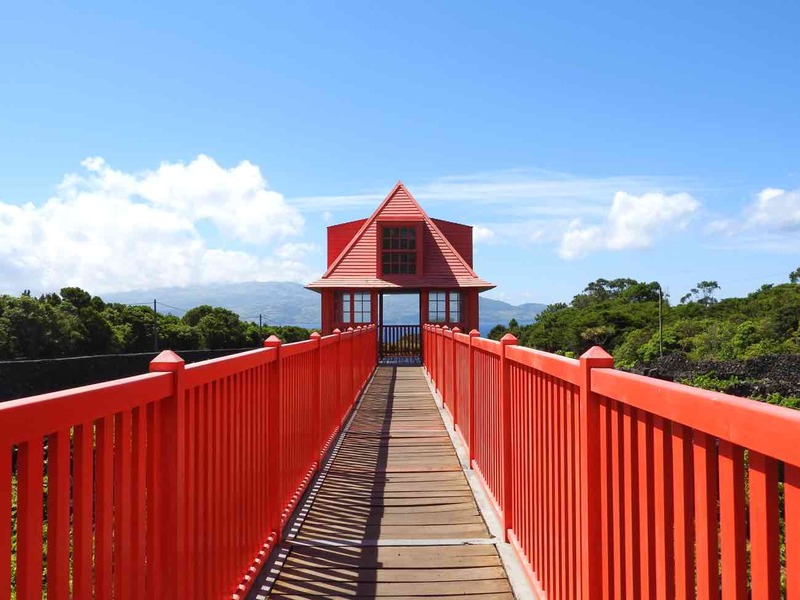 How to get to Pico, Azores? There are basically 2 ways to get to Pico: by sea or by air. Atlântico Line ferries have several daily connections to other islands of Azores archipelago, particularly the “neighbor” islands of Faial and São Jorge. Schedules are (much) more frequent during summer months. The other option is to fly. For now the only airlines flying to Pico are SATA/Azores Airlines and TAP Portugal. Flight prices can be high in the summer season (June-September). Pro tip: you can buy a cheaper flight from mainland Portugal to Ponta Delgada (São Miguel island) and SATA will put you on a forwarding flight to Pico for FREE. Note there is some bureaucracy involved and is subject to seat availability. Weather-wise, the months from May to September are the best ones to visit any island in Azores, including Pico. That said, there are two things to keep in mind. 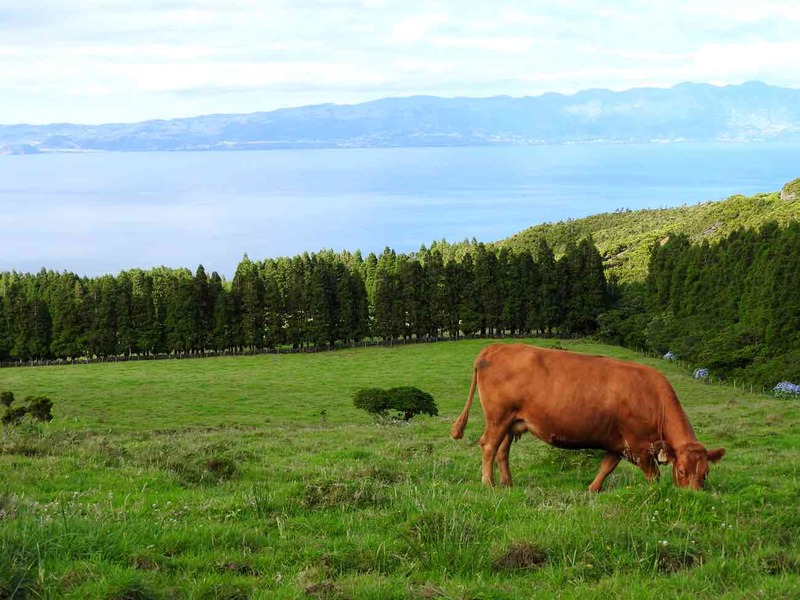 Firstly, the Azores are known for their ever-changing weather. As a local, I know we can experience the four seasons in just one day. That’s even more likely in an island with a dramatic mountain landscape like Pico. For the entire duration of your trip, you may get lucky with 100% sunny days, heavy rainfall days, or anything in between. Secondly: choosing the best time to visit the Azores is much more than just looking at the good weather. Eventually it all comes down on your interests and the activities you want to try. 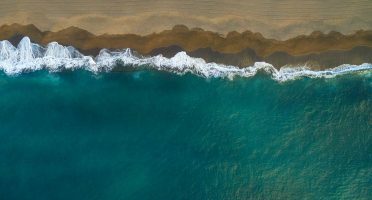 Whale-watching is big in Pico so you might want to look at the March-May period, where the most whale species can be spotted along the coast. When it comes to places to stay, there is a lot more demand than offer in Pico. Make sure you book your accommodation ASAP. I HIGHLY recommend renting a car in Pico. Traveling independently gives you total freedom, boosts the sense of adventure, and will make your vacation truly memorable. You can stop the car to photograph an unique landscape, watch the sunset anywhere, and see some wild rabbits along the way. Plus, public transportation is not reliable in Pico and using tours everyday is tiring and costly. The easiest way is to rent a car directly at Pico Airport. Book early as vehicles – especially automatic ones – are limited. I was a bit unlucky with the local company I went with (Oásis) as they tried to charge me for scratches that were already there. I had taken photos so nothing happened in the end, but still not a pleasant experience. Pick a different one if you can. If you are not sold by the prospect of a fully independent travel and prefer to have everything done by an agency, use Azores Getaways. I usually don’t use travel agencies to book holidays, but this one gas some pretty good prices for flight + hotel to the Azores – starting at 599USD. If you don’t fall into these categories, you’re better off by booking your flight and hotel in Pico independently. Based on my experience, I put together below a suggested itinerary to explore Pico island, with a list of sights up until 3 full days. This is in order of importance. For instance, if you only have 2 days available in the island, my suggestion is that you do the things on first 2 rows. To help you further here are these places in a map. Also below in the next section can find some more detail about the top 3 places to go in Pico. Putting it simply, there are 3 things you can’t miss in Pico: the mountain, wine and whales. Mount Pico dominates the entire landscape of the island and it deserves to be visited. It’s the first thing you see when arriving and the last thing you see (pro tip: get a window seat if you’re flying out of Pico!). I highly recommend hiking Mount Pico. It’s an authentic geology field trip and the views from up there over the ocean and nearby islands are gorgeous (if the weather permits). Personally this was one of the most demanding physical challenges I’ve done n my life. A 7/8-hour hike does not seem that much, but when we’re talking about a harsh and steep terrain, well. Let’s just say my knees felt it for days! A boardwalk on top of vineyards @ Museu do Vinho (Wine Museum). One of the most polarizing landscape views you can see in Pico are the vineyards. Right next to the airport, it’s impossible to miss the huge pattern of black lava rock walls built to protect the vines from from wind and seawater. These are called currais. It’s a stunning contrast to the azure Atlantic ocean and the lush green meadows. In 2004, UNESCO considered Pico vineyards a World Heritage Site. Museu do Vinho (Wine Museum) is a scenic spot to learn more about the wine culture. A tribute to whale hunters, common in Pico’s recent past. Whale hunting in Pico started in the 18th century, when American whalemen came specifically to the Azores to hunt sperm whales. 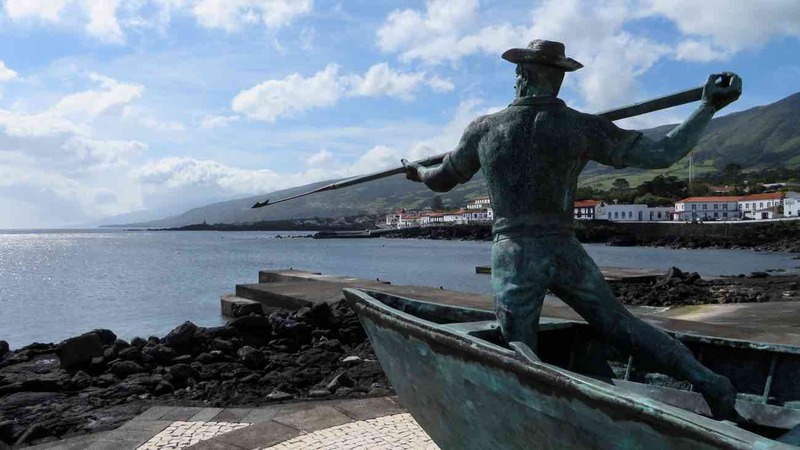 By the 40s and 50s, a whole whaling industry has arisen and played a key role in the economy of Pico, particularly in São Roque do Pico. Workers hunted and “processed” whales to produce flour and oils. This gruesome activity was finally forbidden in 1986 and the industry switched from “whale hunting” to “whale watching”. Today, you can visit a dedicated museum to whalers (Museu dos Baleeiros) join one of the several whale-watching tours. As one of the best places for spotting whales worldwide, this is a must-do activity in Pico. Espaço Talassa is a well-renowned company to go with. Pro tip:Between April and October, the chances of sights of whales and dolphins increase. I recommend staying at least 2 or 3 full days in Pico. Remember if you’re climbing Mount Pico you’ll need to allow a full day for it. Apart from this, allow yourself some time to unwind and explore the landscapes the island has to offer. Staying in Madalena or São Roque is more convenient, but a remote place will make your vacation more special. Sadly the house I stayed in Pico is no longer accepting guests. However the one below is immediately next to it. Stunning rural houses oozing charm. If you want peace & quiet, this is it. The starred sky at night is a plus! 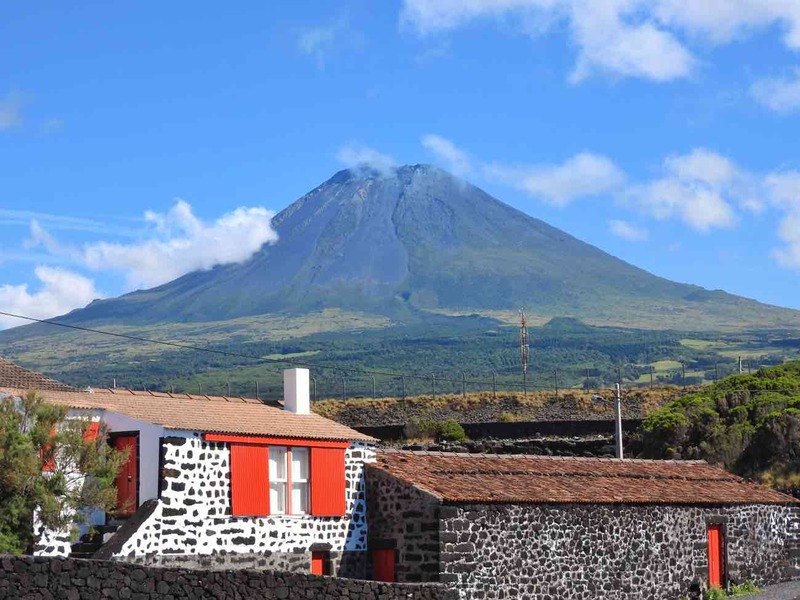 Try starting your search with this shortlist of hotels and rural properties in Pico. It only includes the properties with the best reviews, free WiFi, and parking. Octopus dish @ Casa Âncora. 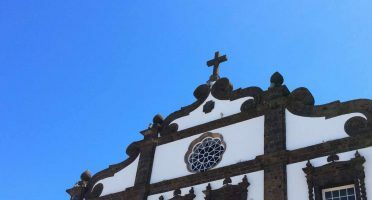 Quite frankly, the food in Pico does not differ that much from what you can find in the rest of Azores or even in mainland Portugal. Do expect lots of local fresh ingredients though, like shellfish and fresh fish – specially cod and tuna – as well as meat-based dishes. Wine is also a must. Ananás (pineapple): it’s actually from São Miguel island, but it’s so good you need to have it whenever and wherever you see it. Lapas (limpets): the most famous shelfish in Azores. They usually are served grilled with garlic, butter, pepper and a bit of lemon. Pão do Pico: typical bread from Pico island. Vinho (wine): a must when you’re in Pico is the local wine from the unusual vineyards that grow on lava rocks. 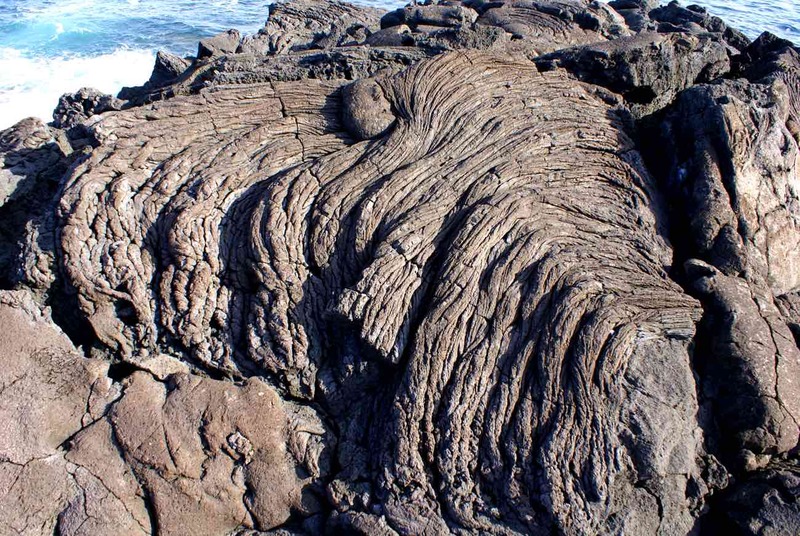 My personal favorite is Terras de Lava. We ended up self-catering a lot in Pico just because our house had a barbecue. We grilled chicken, vegetables, fruit, and everything in between. However, the times we did eat out we had very good experiences too. Here are my 2 favourite spots. Cella Bar: it’s more popular to go for drinks with a gorgeous view over Faial, but they also serve meals with typical Azorean food. The dishes are as stylish as their architecture which is an experience by itself. The fish soup is incredibly rich and tasty and YOU MUST TRY THEIR CHOCOLATE MOUSSE. 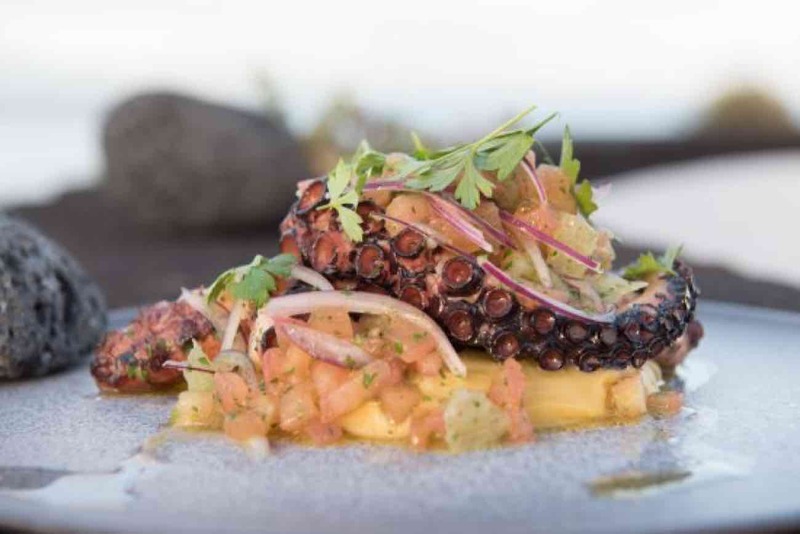 Casa Âncora: opened in 2016 right next to the sea in São Roque do Pico and is part of the new generation of restaurants popping up all around the island. The service is great and the food is impeccably presented, matching the minimal and nordic vibe of the place. Insularity has a price and in Pico it really shows. I found supermarket prices to be higher than anywhere else I’ve been in Portugal. The rest of things are slightly pricier, but nothing scandalous. To give you a good idea of the type of budget you can expect, I’ll give you some examples of what things can cost. The prices are up-to-date at the date of writing of this article (summer 2017). Vehicle rentals: a car is for sure the best way to get around. We rented with Oásis (a local company): 216 euros for 3 days. Quite expensive, but the absolute cheapest we could get in July. Petrol: the price of petrol fluctuates significantly over time, but when we were there, the price of gasoline was roughly 1,3EUR per liter. Food: Local restaurants serve main dishes starting at 7/8 euros. I reckon on average a full lunch for 2 costs somewhere around 25-30 euros. (Now that I think about it I didn’t see many places with lunch menus). Some of the more trendy places can be slightly more expensive during dinner: a full meal for 2 people with wine starts at 35 euros. Water: don’t forget to hydrate! A big water bottle (1,5L) costs no more than 0,8 euros in supermarkets. Accommodation: Honestly I couldn’t get a sense of the normal prices in Pico. Summer season seems to overcrowd the few accommodation places in the island so prices are biased. I’d say if you book in advance you can get a medium-quality double room starting at 30 euros. But if you’re going on a group I highly recommend renting a small remote rural house. It’s cheaper, prettier and adds to the experience. We were 5 and paid 240 euros for 3 nights in our lovely little house like this one in Prainha. Sights and tours: see below some of the prices you can expect for tours and main sights. This means you can get around independently in Pico with less than 60EUR/day, not including any tours. If you cook at home at least once a day, you can even drop this number to a comfortable daily budget of 40-45EUR. This cow has a better view than most humans. Visiting Pico really put things in perspective for me. It particularly made me realize how touristy my home island São Miguel is quickly getting in comparison. The challenge of hiking Mount Pico was definitely the physical highlight, but I was equally impressed with the diversity of stunning landscapes in Pico. On a sunny day, it’s like someone set the saturation levels to the maximum. The green of the meadows, the blue of the ocean, the black of the lava rocks are eye-striking. The views to Faial and specially São Jorge are a delicious extra. 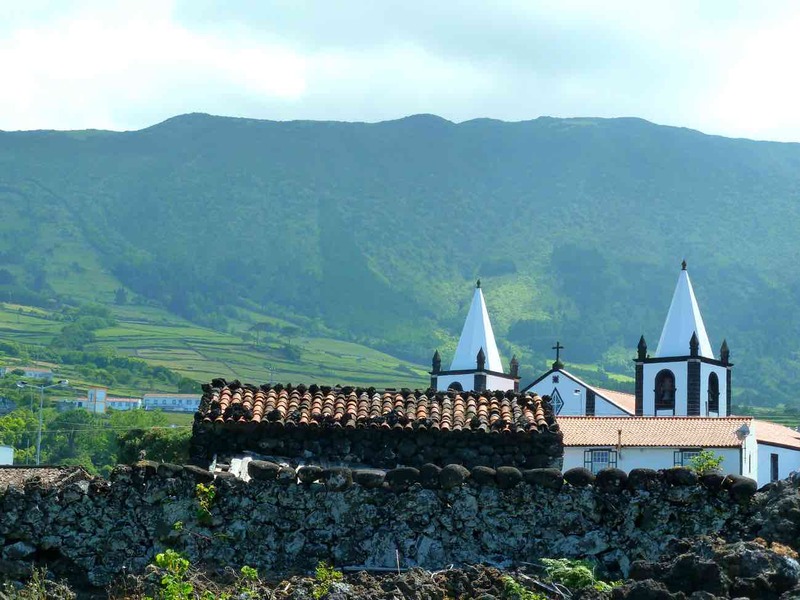 More than any particular sight or activity, Pico is the place to fully embrace the azorean life. Go as local as you can. Rent a rural house as remote as you can. Go to the supermarket. Watch the star-gazed sky at night. Listen to the cacophony of crazy birds (cagarros). You won’t regret it! There’s a reason why Pico is nicknamed the Grey Island. 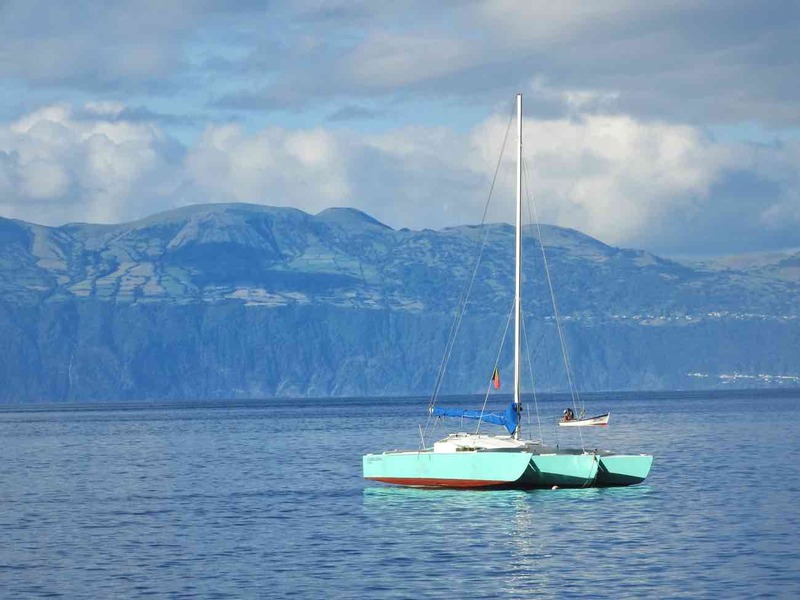 A boat relaxing in the waters between Pico and São Jorge (on the backdrop). 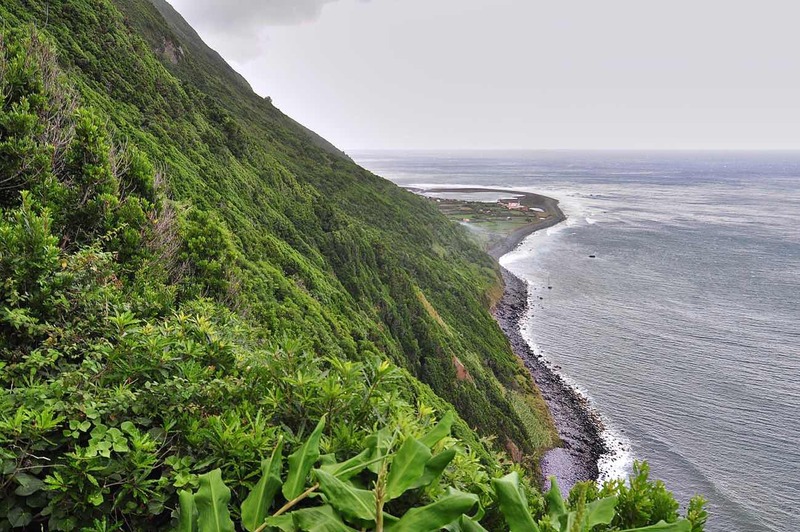 Spot Azores – live webcams of several places in the islands. 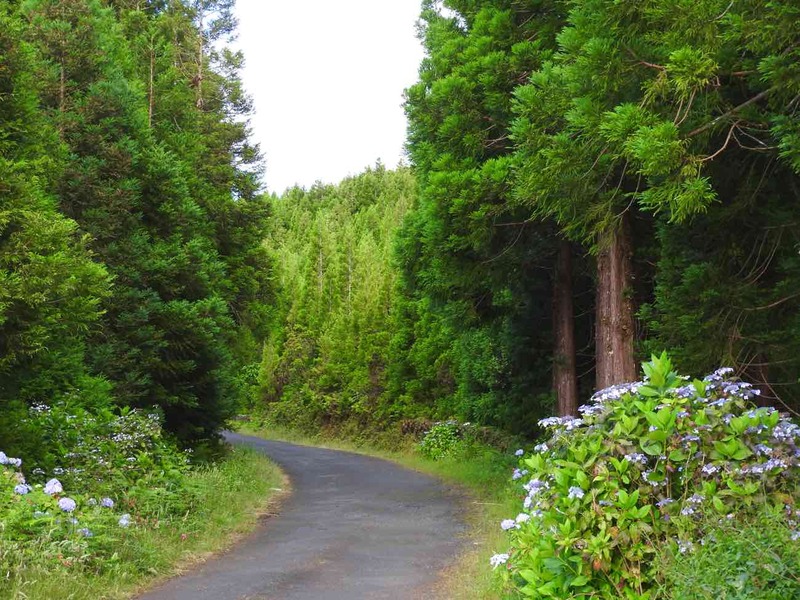 Was this Pico travel guide useful for your trip to Azores? Share your experience below on the comments!